White Wolf : Papa lion wanted to punish his cub, but mom arrived just in time. 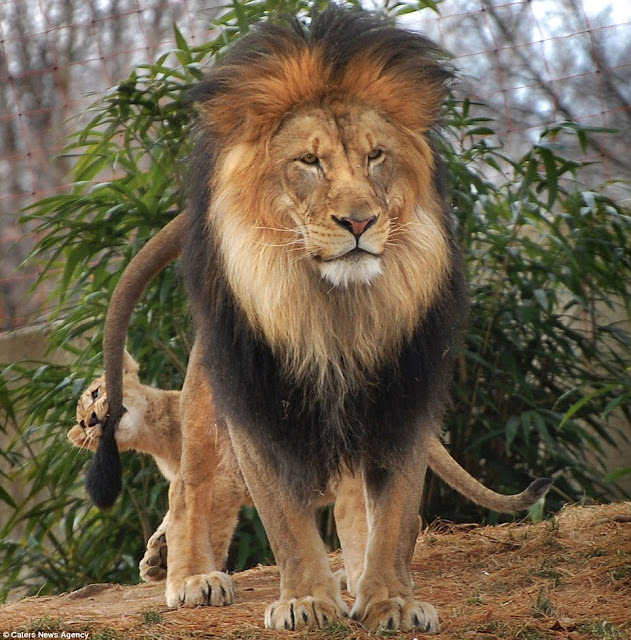 Papa lion wanted to punish his cub, but mom arrived just in time. 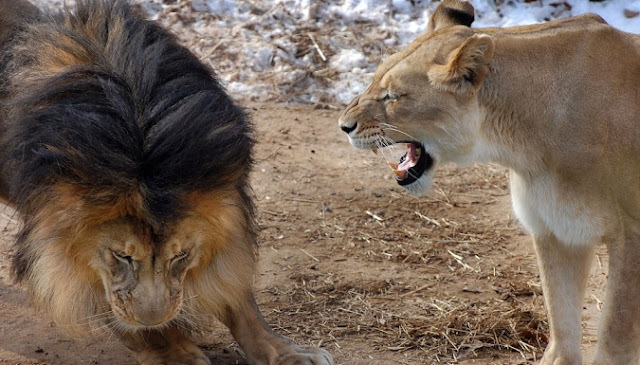 He's supposed to be the king of the jungle, but these pictures clearly show who's in charge. The male lion cowers his head as he is given an earful by a lioness after a playfight went too far. The father had pinned his daughter Lusaka to the ground in mock anger after the playful cub had repeatedly nipped his tail. 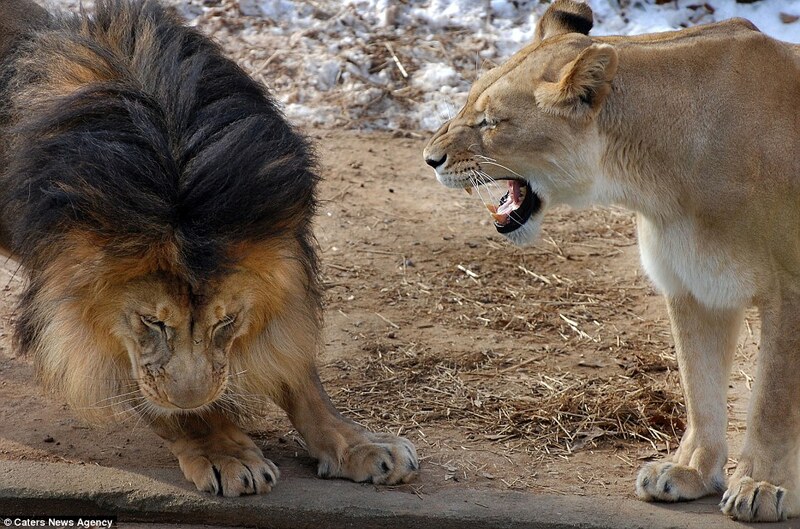 But the pair's fun came to a dramatic halt after the mother arrived and bared her teeth in fury at the male. The remarkable images were recorded by amateur photographer Jennifer Lockridge. 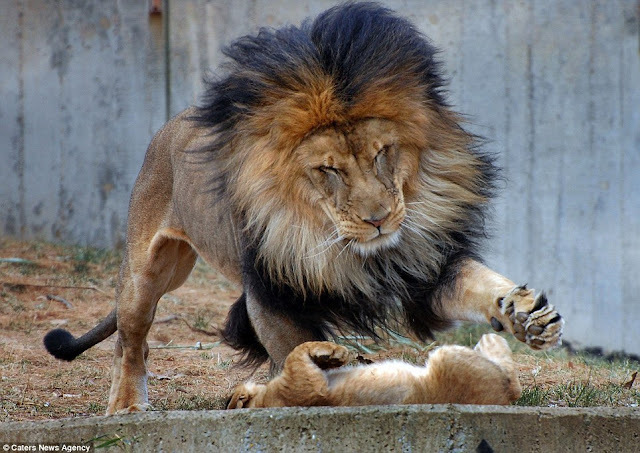 Luke, the male lion, had been pretending not to notice his offspring's attentions, before joining in a playfight. Ms Lockridge, 42, said the spotted the drama during a visit. She said: 'I thoroughly enjoyed watching this interaction and Luke has just recently been allowed to interact with his cubs. 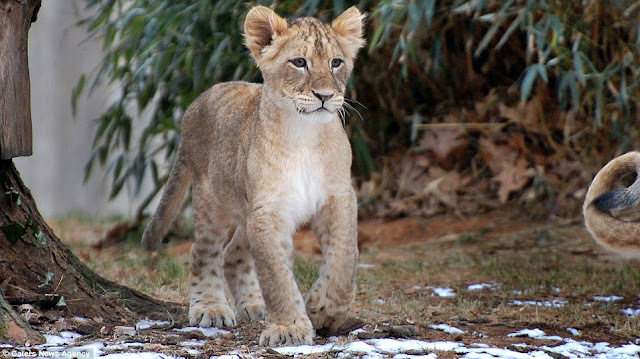 Wildlife refuge has a lion pride consisting of seven cubs from two mothers and Luke is the father of all the cubs. 'The particular cub, Lusaka, is particularly feisty and is always one of the last ones to go inside when called. Lusaka is definitely a "daddy's girl" and seems to be the most enamoured with her father.' She said the way five-month-old Lusaka and her father played together reminded her of human parents and their children. 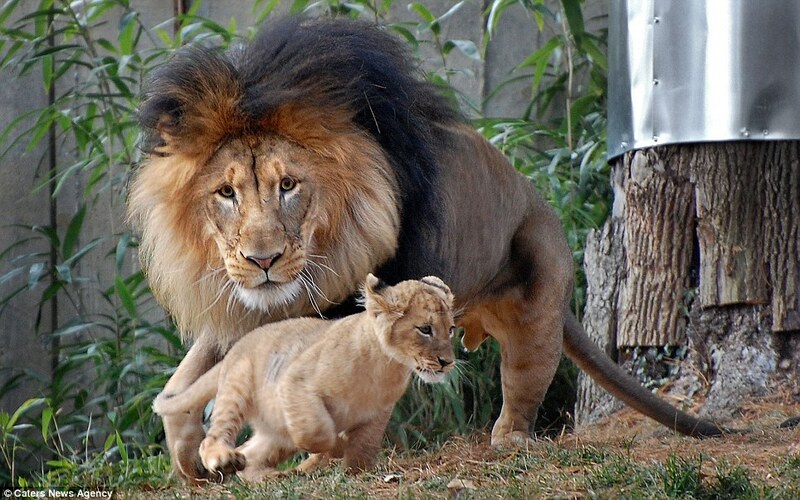 Responses to "Papa lion wanted to punish his cub, but mom arrived just in time." Very interesting interaction! I saw it with my own Kitty's decades ago when Teddy and Whitey used to torment their dad Tommy! Tommy would get fed up and knock them across the room and mom would dress him down big time and he would cower before her! Tommy was a big ginger tomcat and Christmas a small calico, but she ruled!